Pete and Freddie (Abbott And Costello) overhear a Cairo archaeologist's chatter about discovering a legendary mummy and decide to apply as chaperones for the corpse's journey to America. But when they arrive at the archaeologist's home, he has been murdered, they mummy seems to have disappeared and to top it all off, the boys become owners of a sacred medallion that holds the key to the location of an ancient buried treasure that many would kill for! Learning that the medallion is cursed, Pete hides it in a most appetizing place and Freddie bites the bait. Then it's up to the bumbling Americans to preserve the legend of the mummy and keep the treasure from falling into the wrong hands. Abbott and Costello Meet The Mummy is loaded with surprises. One of the most interesting is Lou Costello's daughter Carole appearing as a cigarette girl who pours water all over her dad! This gem of a film is filled with laughs for everyone in your family -- especially Mummy! DVD: Standard 1.33:1; audio English Monaural, French Monaural & Monaural; subtitles English; closed-captioned; single sided - single layered; 18 chapters; not rated; 80 min. ; $24.98; street date 8/28/01. Supplements: Theatrical Trailer; Production Notes; Cast and Filmmakers. After the success of their 1948 horror/comedy hybrid Abbott and Costello Meet Frankenstein, a sequel seemed absolutely inevitable. People like to view the sequel as a fairly modern creation, but this is totally incorrect; movie studios have pushed further adventures of the same characters for almost as long as they’ve existed. This decision becomes easier when the subject offers many easy opportunities, and the A&C/horror flicks created a match made in studio heaven. Universal owned the rights to all of their “Classic Monsters”, and with A&C under contract, they could exploit the two franchises for many years. I found Meet Frankenstein to provide a surprisingly witty and entertaining experience, one that worked well on many levels. I haven’t seen the two intermediate films, but I’d like to check them out to discern how they compare to the first flick. I expect that a decline occurred, but I’d be curious to observe how steady this was. I relate these thoughts because I do know that Meet the Mummy operated from a position of almost-total creative bankruptcy. The drop-off between the funny and endearing Meet Frankenstein and the borderline-unwatchable Meet the Mummy seems astounding, however; it almost appears unthinkable that they were created by the same folks. In Meet the Mummy, Bud and Lou play Freddie and Pete respectively, the usual pair of bumblers who attempt to hook on to something better. In their stabs at success, they become involved in a plot that revolves around a mystical mummy named Klaris. Two rival factions seek his sacred medallion; one wants to preserve it for the culture, while the other wants to use it to find a fortune. Pete and Freddie get caught in the middle and inevitably are played for fools. When I watched Meet Frankenstein, I was especially impressed by the talents of Costello. He made even the lesser material work through his constantly evolving series of perfectly timed reactions and expressions. Granted, it helped that the piece was fairly well produced anyway, but Costello led it to be something particularly special. By the time of Meet the Mummy, Abbott and Costello neared the end of their collaboration, and Costello would be dead within a few years. The difference in attitudes seems extreme, as neither man appears to feel much interest in the project. Since he plays the straight man, Abbott could better fake his involvement, but Costello’s clear boredom and lack of enthusiasm takes a much more substantial toll. He plods through the piece as a mere shadow of his former self, and he doesn’t attempt to do much with the material. Not that I think he could have saved it, for Meet the Mummy presents some of the crummiest jokes committed to film. Actually, it only has about four gags, but these are repeated ad infinitum. We see the same pieces again and again, from puns on “mummy” to snake charmer bits. None are funny the first time, and repetition doesn’t make them more endearing. The pair even make a pathetic attempt to resurrect their famous “who’s on first” routine. Instead, they muddle a discussion of shovels and picks. I always thought “who’s on first” was overrated, but I appreciated it much more after I witnessed this lame rip-off of the bit. I really liked Meet Frankenstein, and I’d also be entertained by other A&C experiences like Africa Screams. However, Abbott and Costello Meet the Mummy shows the pair at their lowest. The film has virtually nothing positive to offer, and its 80 minutes crawl by at a snail’s pace. At their best, Abbott and Costello could be a splendid comic team, but you’ll find no signs of that talent in this dud. 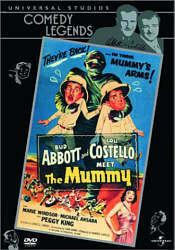 Abbott and Costello Meet the Mummy appears in an aspect ratio of 1.33:1 on this single-sided, single-layered DVD; due to those dimensions, the image has not been enhanced for 16X9 televisions. Although it showed some signs of age, these were quite minor, as the movie has held up extremely well over the decades. Sharpness consistently appeared quite strong. Throughout the movie, the picture remained nicely crisp and well defined, and I saw very few signs of any soft or blurry images. Some light moiré effects appeared once or twice, but I saw no jagged edges, and I also detected no edge enhancement. Black levels appeared nicely deep and rich, and shadow detail came across as quite clear and appropriate. Low-light scenes seemed to be clean and easily visible, and contrast was strong. Despite the age of the material, print flaws remained modest. I saw some examples of grain, grit and speckles, and a nick or two also appeared. Otherwise, this was a rather clean film that failed to manifest most of the problems one might expect. Ultimately, Abbott and Costello Meet the Mummy displayed a pleasing visual experience. Also positive was the film’s monaural soundtrack, which seemed to be fairly satisfying for its age. Dialogue sounded a little thin, but speech generally came across as reasonably warm and natural, and I heard no problems related to edginess or intelligibility. Effects were somewhat flat and tinny, but they displayed acceptable accuracy, and a modicum of low-end response also appeared. Music showed similar tones, except some parts of the score offered surprisingly deep bass; ceremonial drums functioned especially well, as they created nice depth for an older track. Some source flaws appeared, as I periodically heard hiss and a background hum. Nonetheless, I felt pleased with the soundtrack, as I thought it represented high quality material for the time frame. Abbott and Costello Meet the Mummy skimps on extras, which seems like a disappointment after the nice complement of supplements found on the earlier release of … Meet Frankenstein. All we find here are the film’s theatrical trailer plus some text materials. Cast and Filmmakers offers perfunctory biographies of director Charles Lamont plus actors Abbott, Costello, Marie Windsor, and Michael Ansara. Production Notes provides some brief but decent comments about the making of the film. None of these pieces add much to the experience. Not that much would have redeemed the disaster that was Abbott and Costello Meet the Mummy. After a few pleasant experiences with the classic comedy team, I finally found a piece that fell completely flat. This tedious and aggressively unfunny film never found a rhythm or produced anything creative or entertaining; instead, it offered the sight of two comedians at the end of the careers, both ready to let it go. The poor quality of the movie seems even more disappointing due to the fine reproduction of the flick on this DVD. The feature offers very strong picture with solid sound, though it omits any substantial extras. I suppose die-hard Abbott and Costello fans might derive some pleasure from this clunker, but anyone else should maintain a vast distance from Abbott and Costello Meet the Mummy.